Editor’s note: This article grants one continuing education unit (CEU) in the Core category when submitted and approved toward the renewal of a Florida Department of Agriculture and Consumer Services restricted-use pesticide license. When you see a pest in your grove, is your first thought about which chemical you should use to kill it? Pest managers know that there are a variety of ways to combat pests without resorting first to chemicals. For successful pest control, you should understand the pros and cons of the various ways that can be used to control pests. These control methods include biological, mechanical, cultural, physical/environmental modification, host resistance, chemical and regulatory. Growers need to use as many control methods as possible to successfully tackle pest problems. When confronted with a new pest, the options may need to be researched to develop a strategy. Proper identification is always the first step, and Extension and Florida Department of Agriculture and Consumer Services (FDACS) can help. Finding recommendations for control measures is the next step, and you want to find all seven methods of control if possible. For example, let’s look at citrus greening, an insect-vectored, phloem-limited bacteria that causes decline and death of citrus trees that we have become all too familiar with. What are the tools in our integrated pest management (IPM) toolbox to attack this problem, and what research is needed to supply the tools that are lacking? Biological control is one option we love to have. With this option, nature takes care of itself, with a little help from us in finding and distributing our little helpers. However, finding the biological control agent that will attack the pest and not affect the environment in any other way can be expensive and time consuming. When dealing with an exotic pest, researchers have to go to the geographical source of that pest and find what types of natural enemies control the pest in its native range. In the citrus greening example, several insect options have been found for biological control of the Asian citrus psyllid, and the most effective so far is Tamarixia radiata, a parasitic wasp. This little wasp could be a great help, but it does not survive the pesticides typically used in the grove for other pests. Therefore, the use of this biological control has often been limited to organic groves and backyards. Even if you use conventional pesticides regularly, you can encourage biologicals by timing sprays to the dormant season and border applications with fewer applications in the main block, and using modes of action that are less hazardous to beneficial organisms. Don’t underestimate the value of T. radiata. 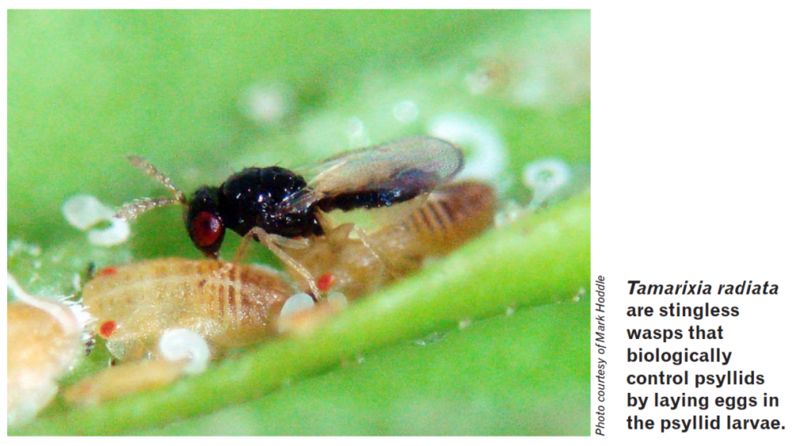 Homeowner citrus has been a reservoir for the psyllids and disease in many places, and this wasp promises to assist with control in places where chemicals cannot be used. If you are interested in getting some of nature’s little helpers, the Tamarixia Release Program is managed by the Division of Plant Industry, Florida Department of Agriculture and Consumer Services. Mechanical control involves the use of devices, machines and other physical methods like traps or barriers to kill or deter pests. 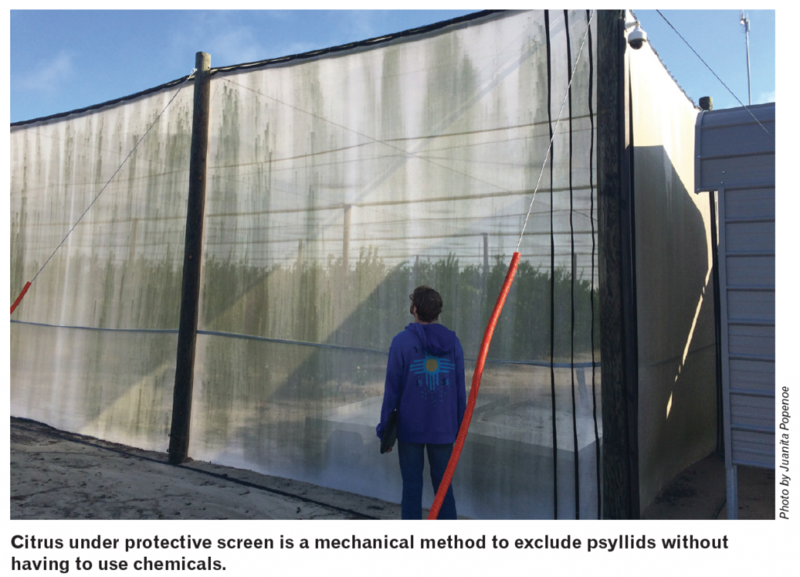 In our example, the Asian citrus psyllid is effectively excluded with screens used in nurseries to ensure clean plants. Screen openings must be smaller than the insect, and care must be taken at entrances and exits to the structures. Screens are now being used in citrus under protective screen (CUPS) production systems and in young tree bags as well. The size of the screen opening can be chosen to exclude other citrus pests like leafminers and aphids, but large enough openings to allow air movement are critical to success. Cultural controls are usually some of the simplest and cheapest measures to implement. They include cultural practices that disrupt the normal relationship between the pest and the host plant or site, which make the pest less successful. Sanitation is the most frequently used technique. Beginning with clean plants was identified early on as the first step in dealing with greening. Growers can also control the stress on the plants, making them less susceptible to the disease. Optimizing irrigation, fertilization and pruning can go a long way toward reducing the impact of the disease. Composts increase the water- and nutrient-holding capacity of soils to encourage root health. Reflective mulches are another cultural control that have been shown to disrupt psyllids and reduce their numbers, especially on smaller trees where there is less shade to nullify the reflectance. Physical/environmental modification can be successfully used, especially in an enclosed area where the grower controls the environmental conditions of water, air movement, temperature, light and humidity. Heat treatments are the environmental modification method tried for citrus greening. Research has shown that this is most effective when used on a potted plant, like those found in nurseries or some version of the CUPS system, where the root system can also be treated. Otherwise, the roots act as a reservoir for the bacteria that will reinfect the treated plant tops, since roots in the soil cannot be effectively heated to killing temperatures. It has not been shown to be an effective tool for plants in the ground. Host resistance or genetic control is the holy grail of integrated pest management. In this method, a plant is used that is resistant or tolerant to the disease or pest. This option is not always possible, or may require a lot of longterm plant breeding. Genetic resistance must first be found, and this has been problematic with greening. Then the resistance must be traditionally bred into the plant while still retaining the high-quality fruit desired, a process that can take many years. Alternatively, if the genetic resistance is isolated, the genes for this can be quickly inserted into current varieties with genetic engineering. This is one technique that is being heavily researched for citrus greening, but it is currently not an option. Chemical controls for the citrus greening vector work, but what do we have to combat the disease directly? Antibiotics are the usual treatment for bacterial infections, but they are not as easy to administer to a plant as they are to people. We have the chemicals that should work, and researchers are trying to find ways to get the antibiotics to the bacteria in the plant so they can do their job. However, the question of residues in fruit has yet to be answered. That leaves us with chemical control of the vector. There have been problems with this technique, too, and we will soon have more problems because of the overuse of a single mode of action. Citrus health management areas (CHMAs) have been used to effectively apply pesticides to large areas to keep psyllids from spreading into nearby groves. Chemicals used are rotated to prevent resistant populations from occurring. Many feel that CHMA applications are no longer important because the majority of trees have the greening bacteria. However, research shows that even if a tree is positive for greening, repeated new inoculations of the disease make the tree decline more quickly. Therefore, the need for vigilant psyllid control continues. Resistance may build up with any chemicals used too frequently. The systemic chemicals widely and successfully used in nursery production and the early years in the grove all have the same mode of action (MOA). When applied as a soil drench, these chemicals may provide sub-lethal levels, another factor that can lead to resistance. Lukasz Stelinski reported recently that increasing evidence of resistance has been observed since 2009. He stated that resistance can occur following only five consecutive applications of any chemical with the same MOA, and rotation works to stop this trend. He suggested having five MOAs as part of any rotation. Regulatory methods are the final item in the IPM toolbox. Regulations are the first line of defense for exotic pests that seriously endanger public health or are likely to cause widespread damage to crops or the environment. Quarantine or eradication programs directed by governmental agencies should help to limit, or at least slow, the spread of any new pest. Eradication of exotic pests has worked well for some issues, but only when identified very early and limited in geographical location. When a disease looks like a nutritional disorder, as in citrus greening, it is very easy to escape detection until it is too late. Pests have a way of getting around agricultural inspection stations, and this method has not worked for Asian citrus psyllids or greening, in Florida or in other states. The IPM toolbox should contain a range of control measures, including biological, mechanical, cultural, physical/ environmental modification, host resistance, chemical and regulatory. Growers should not rely on one or a few control methods, but use as many as possible to be successful and avoid insect resistance. By using an integrated approach, we can conserve insecticide modes of action, encourage natural enemies, and reduce environmental impacts while maintaining profitability and producing quality crops. Citrus greening has tested our abilities to implement a full complement of IPM tools to attack a very successful exotic pest. We are lacking some important tools, but research will provide those. In the meantime, we need to ensure we use as many tools as possible. An integrated approach is the only way to succeed. Juanita Popenoe is a University of Florida Institute of Food and Agricultural Sciences multi-county Extension agent in Tavares.